Boy, did we have a blast with our shapes today! We have finished our shape books, but I still wanted to do something fun with those shapes, and we did. I started off by reading a book I didn't think had an overly WOW factor, but the kids loved it. 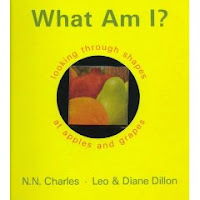 The book is called, "What Am I? looking through shapes at apples and grapes," by N.N. Charles, and Leo & Diane Dillon. They had so much fun guessing the fruit pictured behind the shape. I was even amazed someone got Avocado! 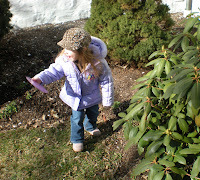 It was bright and sunny out today, still a bit chilly, but fine to get some energy out. 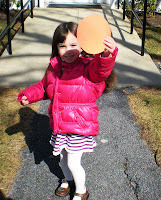 While the children were eating snack I took one of the shapes and hid it outside. 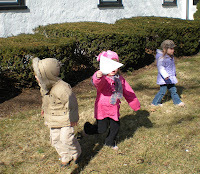 Then after reading the book I told them we were going to go outside and play Hide and Seek Shape. Excitement abounded. I think it took 10 minutes just to coat up. 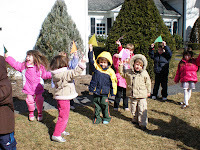 Before we went out for each shape I sang the song of the hidden shape so they knew what they were looking for. They pretty much knew after the first two words of each song. 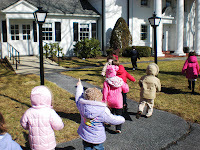 Each child was to find one of the shape we sang about and bring it back to the grassy area. Got the rules down? Ready, set, GO! And they're off. 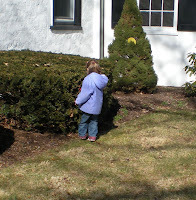 The first seek was more just for the fun of running around outside then looking for the shape. 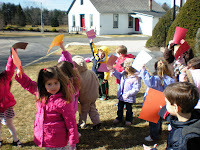 After our shape was found, they gave them to Mrs. T. and I and they hid in the church foyer, while I hid the next shape. We finished all four shapes just in time, moms and dads were arriving as we came in with the last shape. This was really enjoyable. I'm not sure if it was the game, or just the fact that we were outside. I love to be able to get them out. Sometimes finding those minutes during a 2 1/2 hour day are rough. I will skip things just to get them out some days. Love it outside! They look like they are having fun! My kids like "hunts", too. 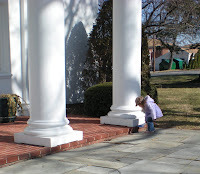 At a Strawberry Shortcake b-day party, I hid little plastic strawberries for all of the kids to find. It was a hit. Hope you are having a good day!